It’s summer again (allegedly) and Bristol Wireless is sitting in the countryside playing with technology. 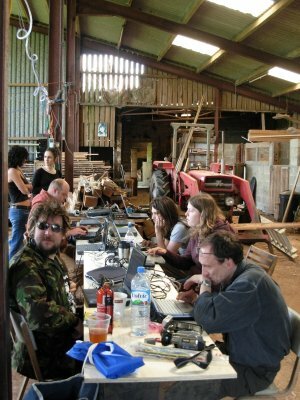 We’re providing the technical infrastructure and running some of the workshops at Hacktionlab (news passim), which is being held this weekend at Stepping Stones Housing Co-operative, Highbury Farm in the picturesque Wye Valley. We’re using the barn as a dining and work area and have the LTSP suite set up in here, as you can see from the picture, and Lloyd has the site covered by wifi. We even have a VoIP telephone on site (some mobile networks don’t work here at all) which has a Bristol Wireless extension number. Mike, Andy, Lloyd and myself arrived on Thursday evening as the advance party, spending yesterday (and part of Thursday evening) preparing the space and site facilities for the main arrivals on Friday and Saturday. After lunch, which is on the point of arriving, Lloyd is doing an introduction to wireless and some software-based sessions on video and aggregation are planned for later this afternoon. Thank you for a great weekend too, particularly the werewolf game and your splendid juggling!